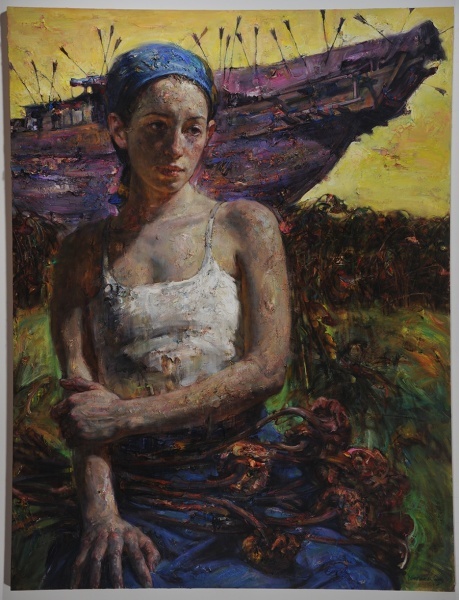 We are pleased to annouce our third solo exhibition, 'Reflections' for Chinese-American artist, Victor Wang. The path through life has been adventurous, exciting, and dream-like. Coming from China and looking for a better opportunity has been a fully challenging and great experience. For me, what I imagined of America and what actually was truly created a great gap, thus forming a battle between physical settlement and mental anxiety. In my recent works, I have tried to ambivalently display this kind of emotional drama with the mixture of exhilarating, confusing, and exasperating tensions. I grew up with sunflower fields surrounding my house in northern China. In my childhood years, I recalled playing under the bright, yellow sunflowers with my brothers everyday. Sunflowers, always following the sun's movements, were used during the Cultural Revolution as a political allegory to the way people should act towards Mao, who represented the sun. Gradually, the people of China realized that this symbol of the follower was really masking a deception. Therefore, to transcend my complex feelings, I use sunflowers as a metaphor to connote my background and emotional stage. My desire is to visualize the human sensitivity of the lost and found emotions upon my life experiences. Although I often gain great pleasure from the process of painting, it is most important to unfold expressively those sentiments within myself.